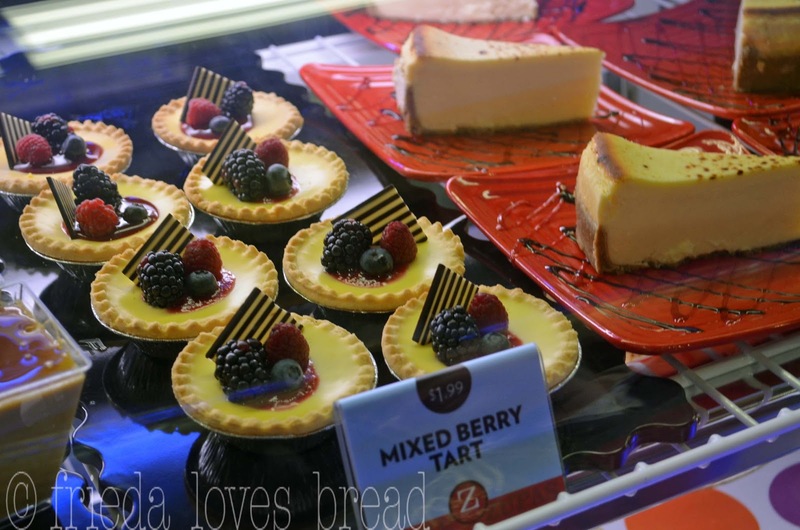 Frieda Loves Bread: Cafe Zupas Now Open in Sugarhouse & A Giveaway! 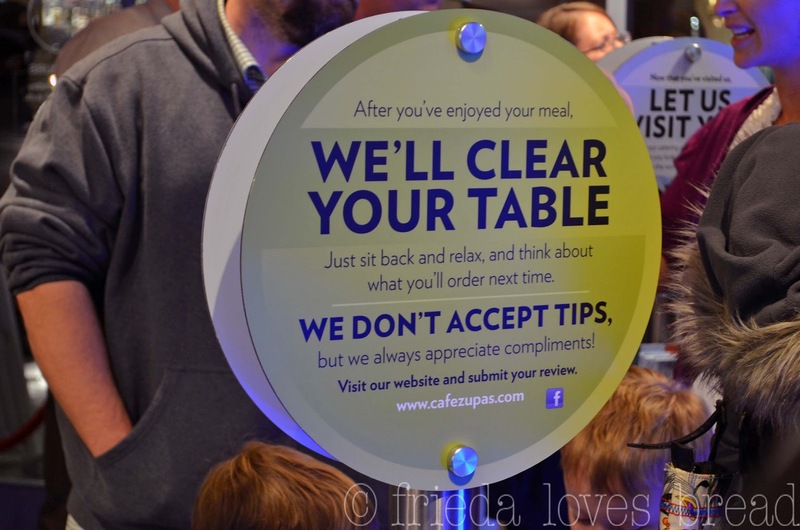 45 Cafe Zupas Now Open in Sugarhouse & A Giveaway! I was lucky enough to attend a sneak preview of the new Zupas in Sugarhouse a couple of days ago. They are now open at 2236 S. 1300 E., just west of the Michael's craft store in the shopping center. FREE dessert with every meal! First 50 people (doors open at 11 AM) get 50% their entire order! They'll be giving away a catered lunch every day during the grand opening! Saturday, Nov. 17 is their Grand Opening party ~ you won't want to miss it! Win free food for a year! One very lucky person will win a $520 gift certificate! A $25 gift card will be given away every 15 minutes! I love how you can individualize your meal (no tomatoes, please) and that they have a kid-friendly menu. This sign speaks to the great service at Zupas ... their staff was very friendly and courteous! 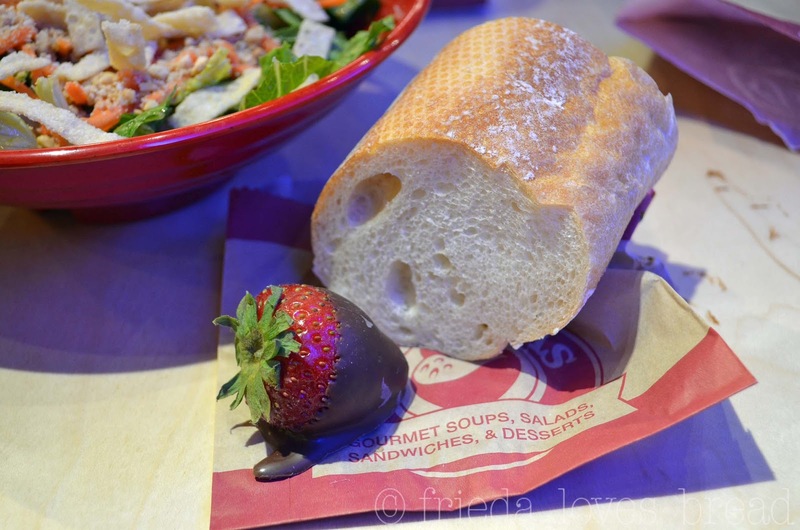 Every meal comes with a complimentary crust slice of bread and a chocolate dipped strawberry! I ordered the Honey Bacon Club grilled panini sandwich with a Shanghai Chicken salad. I loved the sandwich salty/sweet flavor combo of turkey, bacon, ham, Muenster cheese and honey mustard dressing. Zupa's salads are always perfect. I hate it when my salad has way too much dressing, overpowering the taste of the other ingredients, and leaving a soupy, watery mess in the bottom of my bowl. 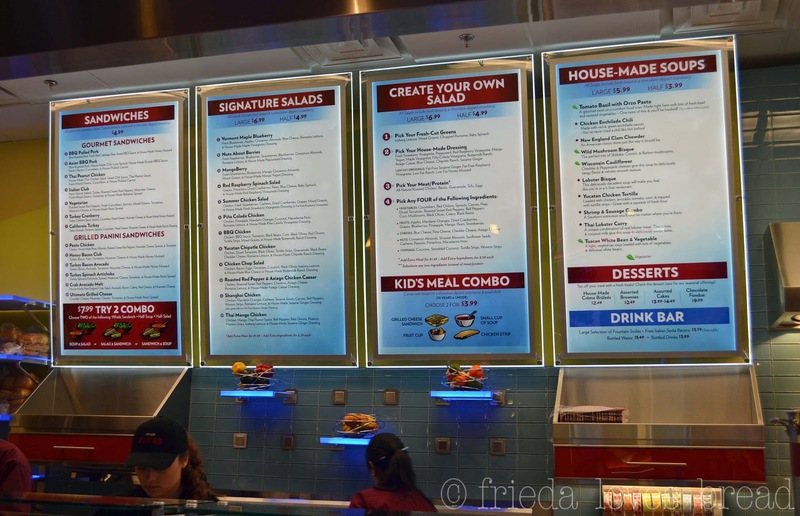 At Zupas, they mix the right amount of dressing with the salad greens in a separate bowl, return the mix to your serving bowl and top it with your requested ingredients. Hubby ordered the Thai Lobster Curry soup and the California Turkey sandwich. The soup was a unique blend of lobster, Thai spices and coconut milk, lending a not-too-spicy, yet exotic taste. The sandwich was perfect for my husband, who loves avocados and Ranch dressing on a hearty roll. No meal is complete without trying dessert! 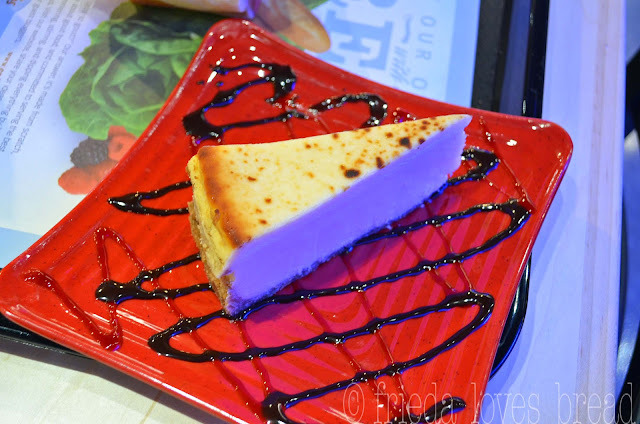 My husband picked out his favorite rich and creamy cheesecake. Me? 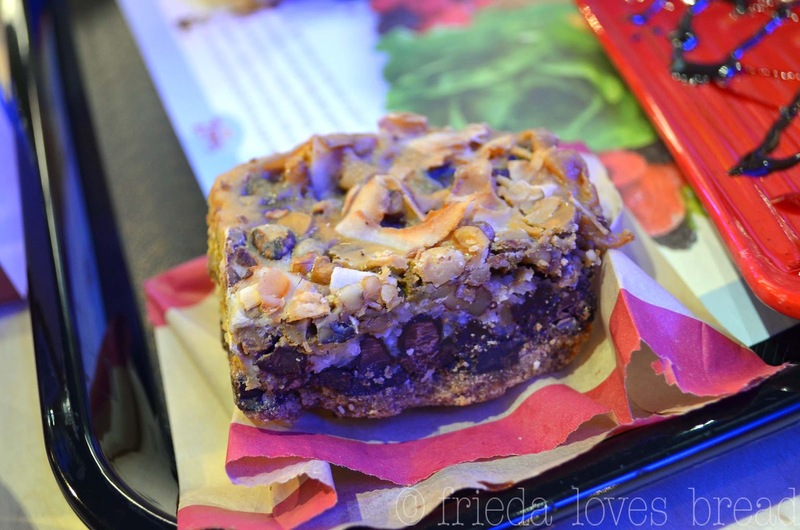 My eyes were fixed on this Million Dollar Bar....reminiscent of the seven layer bars that I grew up with ... only much larger in size! Is your mouth watering yet? I'm getting hungry! The Cafe Zupas Blogger's Cookbook, a hard back spiral bound cookbook filled with over 50 seasonal recipes from Utah bloggers that have contributed to Cafe Zupas. 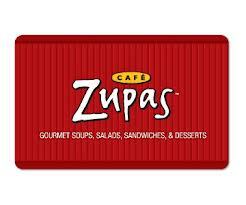 A $25 gift card to enjoy a meal with a friend a Cafe Zupas! 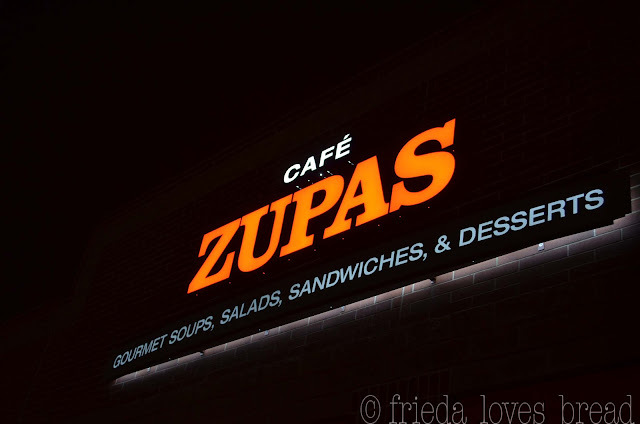 All you need to do to enter is leave a comment (what is your favorite Cafe Zupas menu item) on this post AND say you did on the Rafflecopter form. UPDATE: Many of my readers are saying that the Rafflecopter form is not appearing on this blog. 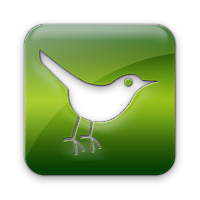 It could be that Rafflecopter is experiencing a surge/overload and has shut down temporarily. It could be the browser you are using. 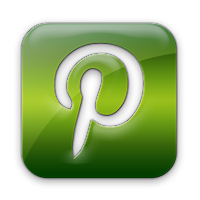 Readers using Internet Explorer cannot see the form; however, I have tested this post on Fire Fox, Safari, and on my mobile devices, Kindle Fire and Android phone, with no problems. If you experience a problem, let me know in the comments below and I will make sure you are entered! I have extended this giveaway by an additional week! 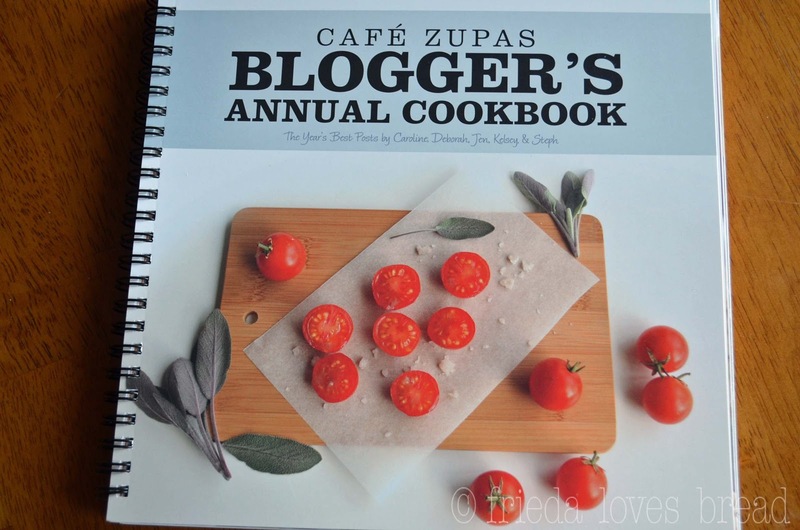 Tweet about the giveaway: Enter to win a $25 Zupas GC and a Cookbook on Frieda Loves Bread! and leave a separate comment for each additional entry. Good luck! Giveaway is open to all US readers and will end November 28. Cafe Zupas generously let me and my husband try a meal, gave us the cookbook and gift card to give away. No other compensation was given to write this post; as always, the opinions expressed are 100% mine. My favorite meal there is the Tomato basil soup with a nuts about berries salad. love it! I LOVE tomato basil soup! Make sure you count this entry by clicking on the Rafflecopter "+1 Do it" button. Good luck! I think straight to dessert for me! I think the pulled pork I would try first. Please enter using Rafflecopter. All you need to do is click on the "+1 Do it." I'd like to try the pulled pork, too! Good luck! I LOVE the lobster bisque. Zupas is totally a favorite! Jennifer, thank YOU!! I fixed it, so it should be working. Cheesy cauliflower soup. What is Rafflecopter and where to I find it?? Rafflecopter is the box at the end of this post, right above my signature. It allows me to select a winner at random ~ good luck! I just got a thing in the mail yesterday about this Sugarhouse opening! I think I'll go and get a bowl of their marvelous chicken enchilada chili. What a great giveaway. Thanks! I've only been once but, oh my, it was good!! I've never been but the pulled pork and cheesecake look Devine! 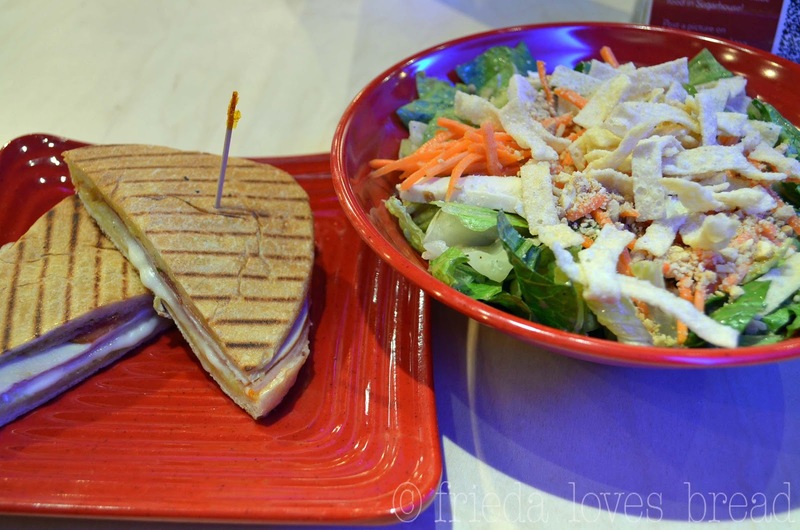 Zupas is my favorite...I always get the summer chicken salad and the turkey cranberry--panini style. 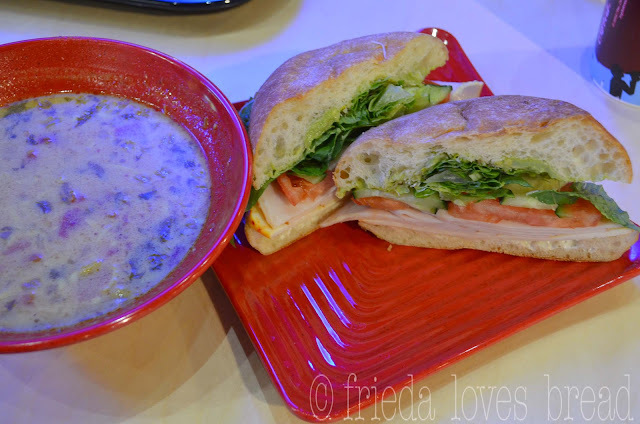 I love their california turkey sandwich and the cauliflower soup! 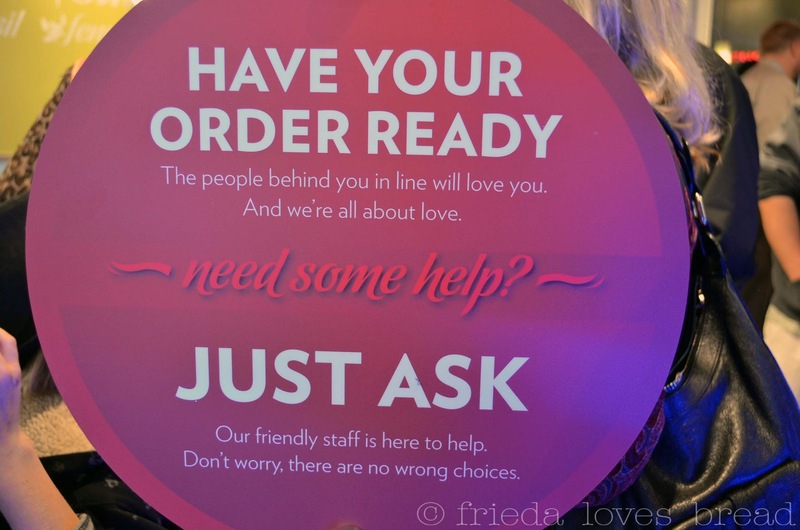 Thanks Frieda! I love their Tomato Basil soup! I keep refreshing the page, but the rafflecopter isn't showing up. I just checked and it is showing/working for me. Are you using a mobile device? The Nuts about Berries Salad! I am a huge fan of the chicken chop salad, we love the tortilla soup, and our new favorite is the turkey cranberry sandwich. Clearly we eat here waaaay too much. I have a red star yeast giveaway going on right now and a reader linked to a post of yours and here I come to find your awesome site and this giveaway. I don't even care about the $25 - I just want that cookbook!! Blogger's Bests and I bet they are all awesome! I love the mushroom bisque soup.Yummy. Rafflecopter isn't showing up above your signature. Is it working and just not showing up in my browser? I love the make-it-your-own-way salads! Love the lobster bisque though! Ugghhh....So sorry! please leave an Name/email address so I can contact you if you win! Michelle, I added your entry! I love the chocolate dipped strawberries. I'm hearing SO many great comments about the berry salad! Thanks for letting me know Rafflecopter worked for you! Mix the soups?!? Amazing! Never thought to do that! Of course I always mix alfredo with marinara sauce, so it would make sense with this soup combo. Thanks for the idea! Frieda, I read this earlier today. After sitting next to you tonight, I have to comment and tell you how fun it was to add the face to your blog! Great post! Thank you, Jan! It was great to visit with you and meet your cutie pie! I still can't get Rafflecopter to work on IE, but I hope you'll enter me anyway. I will enter you in! All the soups are great but I especially love the Wisconsin Cauliflower! I just tried the Wisconsin Cauliflower soup for the first time last night and it was SO good! I am NOT a fan of cauliflower and could not taste it at all. It tasted like a good, creamy, cheese soup. the Yucatan Chicken Salad sounds wonderful! We don't have Zupas where I live, so I would love to try out the recipe book. Thanks for the chance at a giveaway. I absolutely love everything I've ever tried at Zupas! But the Thai Lobster Curry Soup is one thing I can't resist getting! I was able to use the Rafflecopter form no problem.